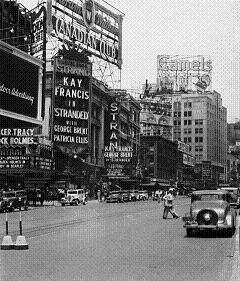 The Call of "The Great White Way"
New York City's Broadway in the 1920s was a hub of neon lights, action, fashion, music, and crime. "The Great White Way", runs like a vein through the center of New York. In the Twenties it was the center of action, from Harlem to Tin Pan Alley and beyond. The first major show was the "Ziegfeld Follies." The Follies' women hypnotized the audience with their long legs, beautiful faces, acts of grace, humor, and even (sometimes) talent. The Follies marked a shift away from the sleaze of Satan's Circus making the men's lust and sexuality for chorus girls safe for the upscale audience. As popular as the Follies were, they were hardly the only show in town. Between the Yankees, jazz venues like the Cotton Club, the speakeasies, and all the "Big Street" theaters, New York was a Mecca for the exciting new sounds and fashions of the day. Plus with the famous characters like Louise Brooks and Babe Ruth, the celebrity "Jazz Mayor" Jimmy Walker, and all the famous gangsters like Owney Madden, "Horseface" Larry Fay, and Jack "Legs" Diamond Broadway was a cornucopia of action and excitement. With the advent of neon lights, Broadway became the glittering ghost of perpetual night. Much like the new fashions of the day, Broadway theater gave New Yorkers an escape from the stodgy and uptight ways of the Victorian era. Though "The Great White Way" itself had never bowed to the social constraints of prudishness, its patrons changed with the times and the escape of the bright lights became acceptable to the flappers, lowlifes, celebrities, debutantes, Gold Diggers, gangsters, and mucky-mucks. Broadway became a Three-Ring Circus of capitalism, debauchery, action, fun, and crime. Gangsters like "Legs" Diamond, popularly know as the best dancer in the city, and Owney "The Killer" Madden, the ruthless mobster and proprietor of the Cotton Club, became the unofficial Dukes of Broadway: providing liquor and ladies to all who could afford such novelties. As Jerome Charyn writes of "Legs" Diamond in his great book Gangsters & Gold Diggers, "With his wide-brimmed hat and haunted eyes he's captured the public's imagination: mean and lean, a killer with a sense of style." Through the 1920's, New York and Broadway would remain ground zero for celebrity, scandal, and capitalism in America's "new era." In the later half of the decade New York's adopted son, Babe Ruth would mash 60 home-runs in his newly built Yankee Stadium, signaling a new era in sports, the end of the dead ball era and walking billboard status type celebrity. Ruth not only captured the excitement of New York he captured the imagination of the nation!!! Musicals continued to sell tickets at an amazing pace, 264 new plays were opened in 1927. Another huge release upon the consciousness of the world was the first movie featuring sound, The Jazz Singer featuring Al Jolson, marked the swan song for the silent feature film. However, the stars, the innovations, and excitement of the Roaring Twenties could not last forever. Much like the Dot.com bust of the 1990's, the end of the 1920's brought chaos and hard times upon the madcap romp of "The Great White Way". The glut of money and products could not be sustained and eventually someone paid the piper. Nowhere was this more evident than on the "Big Street" and later upon Wall Street. Historians have noted that the murder of the "banker to the underworld," "The Brain" Arnold Rothstein was the beginning of the end for the carefree days of the 1920's. As Charyn notes, "[Rothstein] was the knot between the gangsters, politicians, and the police." Rothstein was also reportedly behind the whole 1919 Chicago "Blacksox" scandal. Perhaps it's a bit ironic that "The Brain" was found with a bullet in his groin? "Mr. Big," as Rothstein was also known, is a key figure in 20th century organized crime. After his death Mr. Big's enterprises were left to Bugsy Siegel and Meyer Lansky, two integral men/gangsters in the creation of Las Vegas. With Rothstein dead, slowly the speakeasies, brothels, and nightclubs were shut down under the auspices of the prohibition. In 1932, when Flo Ziegfeld breathed his last with 11 rubber bands and 10 bucks in his safe, the Broadway of the Roaring Twenties wasn't much more than a memory.